Let me start off by saying: I… LOVE… SHOES. I love them love them love them. I own probably over 100 pairs (no, that’s not an exaggeration… I can feel your judgment coming through the computer screen). In the words of Lady Gaga, I was born this way! When I was a little girl and my parents would have visitors over to the house, I would go upstairs, take all my shoes out of the closet, bring them down, and show them to everyone (score 1000 blog points for adorable childhood story). However, when I took up running my experience was a little different. As is pretty evident at this point, my budget is REALLY tight. I am the queen of bargain shopping and I have come up with many crafty ways to have over 100 pairs of really fabulous shoes on my budget. But running shoes are totally different. First off, they can be SUPER expensive and they wear out kind of quickly (especially when compared to the shoes I have owned since freshman year of college and are still going strong). A good pair of running shoes can get about 500 miles on it, but some really vary. I run a lot of miles, so 500 miles goes by a lot quicker than my budget can handle at $100 a pop. On the other hand, you really don’t want to skimp when it comes to your running shoes. I have a knee injury that needs kindness, and I want to be running for a lot of years to come. So here are a couple tips for buying great running shoes when you’re on a budget. Shop the sale section (DUH!). Do your research ahead of time. Make sure the shoe is the right kind of shoe for your stride (if you haven’t had a stride analysis you can usually get a free one at a running store, or you can get one over the internet here!). You also want to pay attention to things like weight and heel drop. Buy closeout models. Running shoe companies release new models of shoes ALL THE TIME. Find a great website where you can buy the “old” model on closeout. Use a discount website. I might get some heat for this and, trust me, I would love to support small local running stores more. I just can’t ignore the deals online… SORRY! My go-to running shoe website is Running Warehouse. Free 2-day shipping, Free Returns, always great closeout sales. Keep a spreadsheet of the mileage you track on each pair of shoes in your rotation (or just your current pair if that’s how you roll). This can let you know when a pair is getting close to retirement, and you can make some room in your budget. Keep “retired” shoes for other activities. Just because a shoe is done for distance running doesn’t mean you have to throw them away. I have old shoes EVERYWHERE. I keep a pair under my desk, a pair at my parent’s house, and two pairs at home. I wear them to my softball games, walking around the city, to the gym for a non-running workout (like lifting, spinning, etc.) You don’t need a special pair of sneakers for those activities. Here are the shoes that are currently in my rotation with some information on price etc. 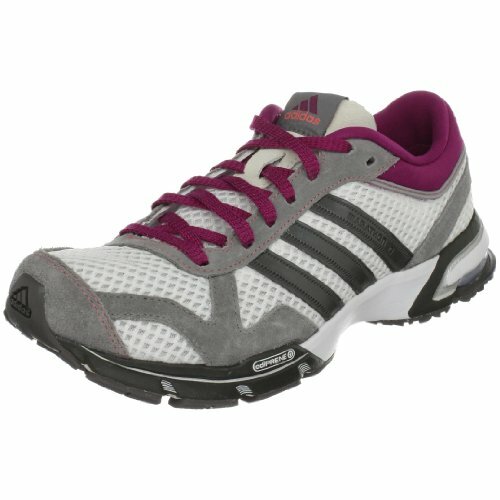 Adidas Marathon 10 Women. These are actually reaching retirement sadly (I might just get another pair if I can find them). They are a great distance trainer. I wore these on almost all my long runs during marathon training. I don’t typically race in the them even though they’re really nice and light. I got these on sale at CitySports for around $50 (originally $80). 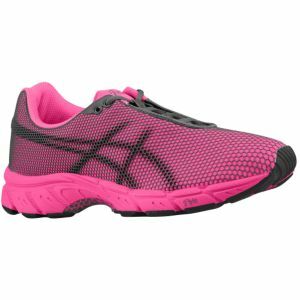 Asics Gel Speedstar 5 in Hot Pink. 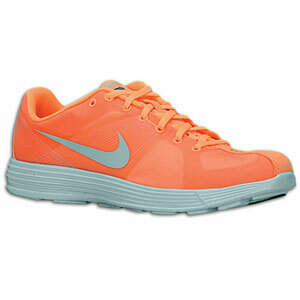 I LOVE these shoes and will be running my marathon next weekend in these. They’re so light and the fabric is really cushy around the sides / top of your feet. I have raced my last two half-marathons in these and did my last 20 miler of marathon training in them. I got these from Running Warehouse (closeout sale) for $57.96 (originally $89.99) Although the link to the picture has them on sale at Lady Footlocker for $39.99 now… very interesting 🙂 There might be another pair of these in my future.